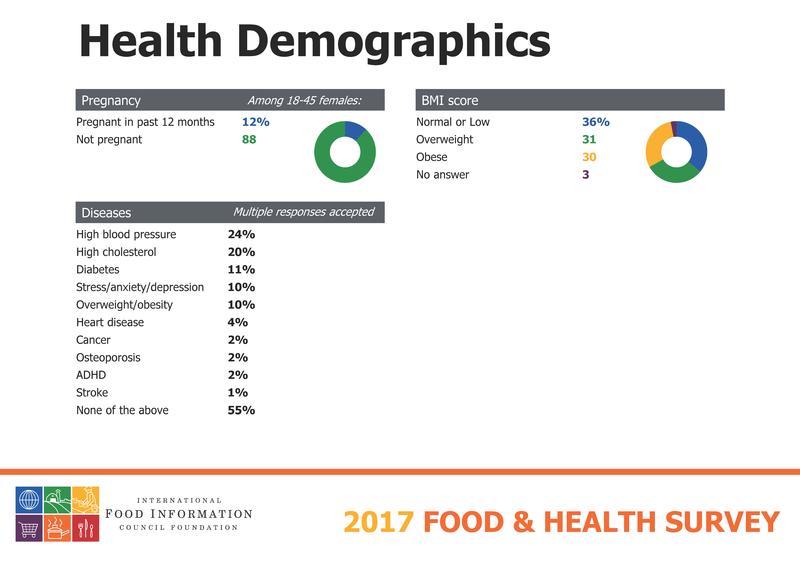 The 2017 Food & Health Survey from the International Food Information Council based findings on a false assumption about BMI and health. 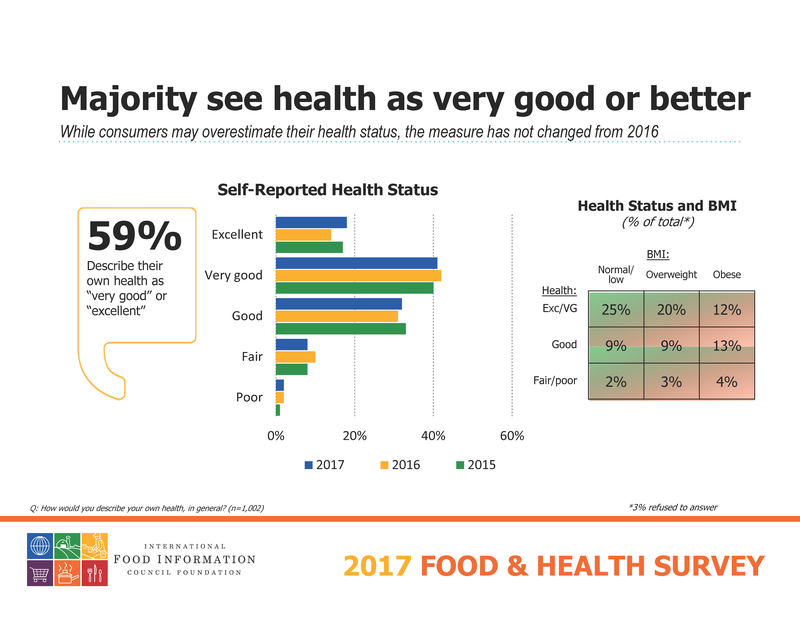 This week, the International Food Information Council (IFIC) released findings from the 2017 Food & Health Survey, which investigated the health beliefs and behaviors of Americans. I read a wonderful summary of the study in the Washington Post with pleasure, as the findings from this survey are enormously useful to me as I plan which types of nutrition classes and outreach efforts might be most valuable to my clients and to my community. The association between obesity and incidence of chronic disease (e.g. diabetes, heart disease, and cancer) and increased overall mortality (i.e. rate of death) is strong (although the relationship between overweight and health risks is still a matter of debate). 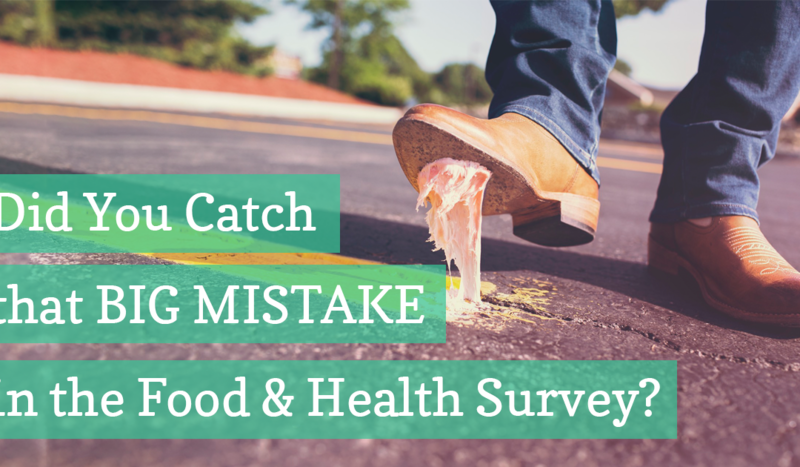 However, the researchers at IFIC, who assert that someone who has a BMI greater than 25 would be incorrect in classifying themselves as “healthy,” are forgetting that BMI is a screening tool, not diagnostic test of body fatness. People with BMIs in the overweight range and obese range can be just as healthy or healthier than people with lower BMIs. I see this every day in my nutrition practice. This is also illustrated nicely in a 2016 study published in the International Journal of Obesity. Researchers used a national database of more than 40,000 Americans to investigate the relationship between BMI and health measures such as blood pressure, cholesterol and insulin resistance. Their findings supported the association between BMI and health risk, with a 70 percent of people with normal-weight BMIs in the healthy range for all health measures compared to 47 percent of people who had BMIs in the overweight range, 30 percent of people labeled obese, and 16 percent of those considered. Of course, if 70 percent of people with normal-weight BMIs are healthy, it also means that 30 percent of these individuals are not. And if almost half of people with BMIs in the overweight range and 30 percent of people considered to be obese had heath measures within healthy ranges, the IFIC’s broad conflation of health status with BMI is spurious. The decision to pool people with BMIs in underweight range with those in the normal-weight range and classifying them all as “healthy” is especially puzzling when we consider the growing evidence for an association between underweight status and increased overall mortality (even given that the major causes of death among people with underweight and obese BMIs differ). 3. They already have the data they need to do this better! One must wonder why the IFIC chose to use BMI as a surrogate for health status when they had on hand information about their study populations health measures such as high blood pressure, high blood cholesterol, and diabetes. I encourage the IFIC to reconsider their assertion that “many Americans are overestimating their health status” because it is based on the false assumption that everyone with a BMI above 25 is “unhealthy” and everyone with a BMI below 25 is“healthy.” This is simply not supported by the literature. Moreover, these conflations contribute to the pervasive weight bias in our culture.